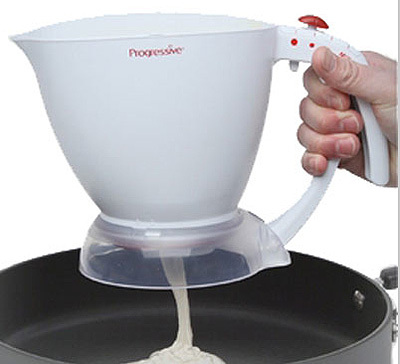 If you ever make cupcakes, or pancakes even, you NEED one of these uber cool batter dispensers. Love. Love. No more messy cupcake pans, no more different sized cupcakes, just no more! I got this totally cool contraption from my friend Krista. Krista owns a really nifty online store and I’ve been getting awesome stuff from her for over ten years! Her store is called KidSmart Living and she carries oodles of kitchen and houseware items as well as some really cool child safety products. Over the years I have collected unbreakable glassware, awesome sturdy mixing bowls, heavy duty plastic dinnerware for my camper, collapsible storage containers, grilling essentials, and I showed you this fabulous cherry pitter last summer. I have used this batter dispenser twice. Once when I made some cupcakes for my daughter from a cake mix, and the second time was when I made these Orange Creamsicle Cupcakes. It worked perfectly both times. You can get all but about two cupcakes from the dispenser, then just use a rubber spatula to get the rest out. Perfect cupcakes both times! You put all the batter into the bowl of the dispenser. 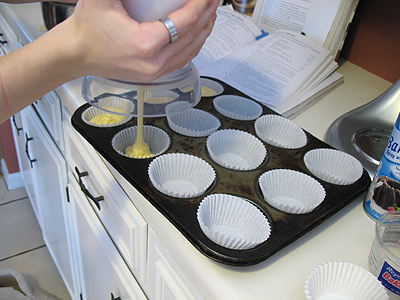 Then simply squeeze the trigger while holding the dispenser above the cupcake pan. You can get one for yourself, because you know you want one, by visiting KidSmart Living. Tell Krista that Amanda sent you! Which setting are you using for perfect cupcakes? Will this setting give a flat top or rounded top? I have a wedding cake with about 110 cupcakes. This should be a help getting them all uniform in size.